Please email WSC_travel@warwicksoccer.com with any questions. There should be no cheering or individual coaching during a tryout. During the tryout sessions, all players will be evaluated to determine selection and team placement. In each age/gender group, the Travel Committee will be responsible for setting and implementing guidelines for player evaluation based in the Travel Tryout Evaluation Form. It is important to note that attendance and performance at the club’s tryout sessions is not the only process used for evaluating and selecting players for the travel club. Players may be evaluated from scouting games, practice and informal scrimmages, by recommendations from coaches and from a player’s performance throughout the year. Specific information regarding a player rating/ranking will not be shared with parents or other members of the community, due to the sensitive nature of the information. The mission of the Warwick Soccer Club travel team tryout and selection process is to ensure that all players receive a fair opportunity to join a team of their peers possessing similar game skills. Teams for each age group will be formed to maximize the number of qualified participants in travel soccer. The number of teams formed for each age group will be determined by the number of qualified participants in tryouts and the number of coaches available. Teams will be formed based on skill level. The top rated players will form a team that will play in a higher flight than the next team and so on. 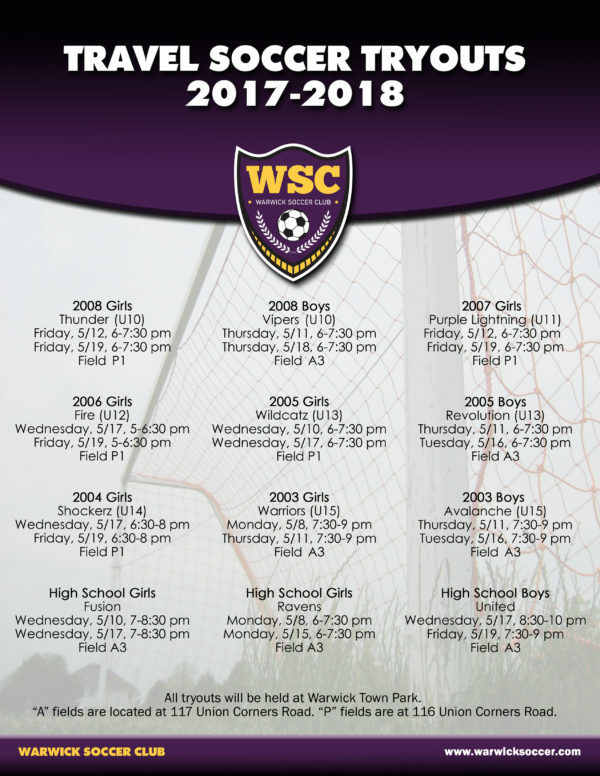 If there are not enough players or coaches to form a second or third team, all tryout participants not chosen for a roster position will be encouraged to play in the WSC REC program and attend tryouts the following year. The Warwick Soccer Club requires players to demonstrate sufficient proficiency to play travel soccer from U11 and beyond. As such, if coaches have roster spots available but any player trying out is deemed by the Travel Committee to be significantly less skilled than those on the existing team, that team is not required to add this player. 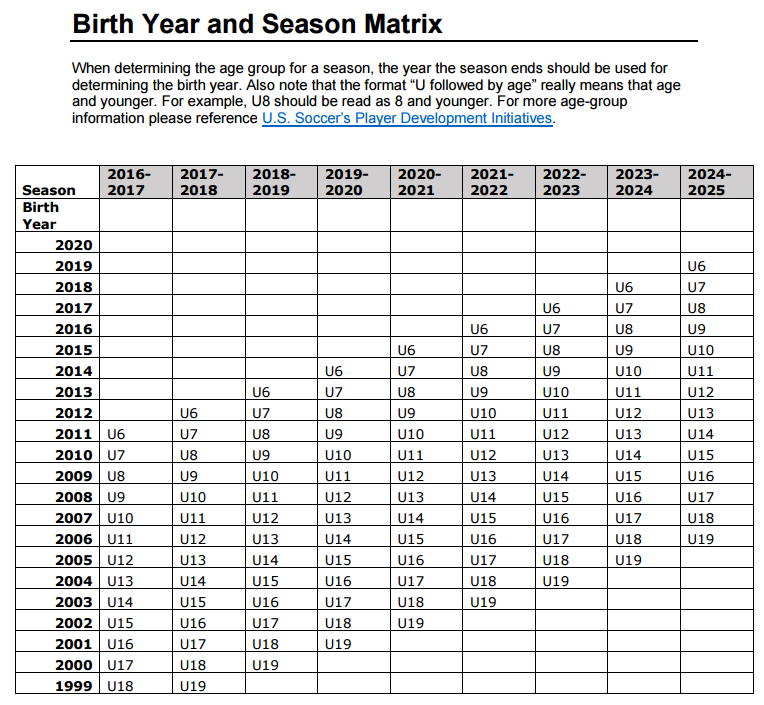 In the U9 and U10 age groups, rosters should be filled if players are available and want to play. During the spring U10 season and beyond, if coaches believe that they have rostered players whose lower skill level is limiting the progress of the group, the coaches may request an evaluation by the Travel Committee. If the Travel Committee agrees that this player is not able to play at the necessary level, arrangements will be made to remove this player from the roster at the end of the season. Every effort must be made to support this transition for the player. Roster changes through this mechanism should only occur at the end of the spring season. Tryouts are open to all resident U9-19 girls and boys. A resident player is defined as a Town of Warwick resident or any player attending a Warwick School. Teams are first populated with Warwick residents. If open roster spots remain, non-residents can be utilized for a team. Once a non-resident player is accepted to a team, during future tryouts their evaluations will not be subject to out-of-town status. The tryout process is held once a year in the spring and consists of two individual tryout sessions. The results of these tryouts will determine the teams for the following fall and spring seasons. Participants are required to make at least one of the tryout sessions and are strongly encouraged to attend both. Tryouts should only be held at the Warwick Town Park soccer fields. Will take place during existing pre-travel practice session in mid-May. Tryout players will attend regularly scheduled team practices. Schedule TBD. Current travel players must NOT wear their uniform jerseys. Existing travel players who show up in any part of their uniform will be asked to leave to change clothing. Players must bring their own ball and wear shin guards. Players must bring their own water. The Travel Committee will work with coaches to determine the roster for the upcoming season. Emails of acceptance or rejection will be sent out as soon as selection is made. This is typically within a few weeks of tryouts. There will be no registrations after the season starts without Travel Committee and Board approval. Having previously played for a team does not guarantee a spot for the next season. Initial Parent Meeting – Within 1-2 weeks after player notification, each team should hold a meeting for the purposes of giving parents an opportunity to meet each other, to identify parents who will act as team manager, treasurer, etc. and to complete necessary administrative tasks. Parent Meeting Notification – The Travel Committee will notify parents about the initial parent meeting. They will provide electronic copies of forms listed below and a description of the required parent volunteer positions, and will instruct the parents to bring the following items to the meeting for collection at the meeting. Birth certificates, passports, or other appropriate identification (for U-9s and new older players). email addresses; date of birth; and school. A completed parent code of conduct. Ideas for team name for new teams. For U9 teams, explanation of basics and philosophy of travel soccer for WSC program. Introduction of Coach and Assistant(s). Explanation of coaching philosophy and expectations. Confirm the established travel club payment dates and policies. Collection of administrative paperwork, including but not limited to player and parent code of conduct forms, player agreements, signing player pass cards and other necessary tasks.